Use the Almanac below daily to help you in selecting the most auspicious days and times for activities and events such as weddings, renovations, travelling, opening a business and even a good day for mending your tools. A Chinese almanac (Chinese calendar) or “Tung Sing” is based on the lunar cycle, providing a guideline that either promotes or advises against certain tasks being undertaken on certain days depending on the combination of the Heavenly Stem and the Earthly Branch. Virtually every home in Asia will have one of these and refer to it daily, it tells you when to do and not to do certain jobs or events. Sallie will be translating the almanac each month so check back monthly for updates. The ten Heavenly Stems are the five elements of water, wood, fire, earth and metal. The Twelve Earthly Branches are the twelve animals of Chinese astrology: rat, ox, tiger, rabbit, dragon, snake, horse, sheep, monkey, rooster, dog and pig. The stem and branches express each other in a 60-year cycle in terms of the five elements in their yin and yang states. 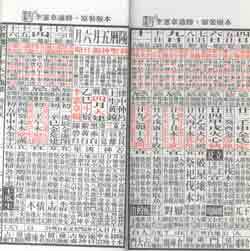 A “Huang Li” or imperial calendar with recommended days to proceed with or avoid certain tasks or projects during the year. There is a section dedicated to recommended days for “spring cleaning” before Chinese New Year. Favourable or unfavourable days according to an individual Year”s Pillar of the Four Pillars “Ba Zi”. An example would be if you were planning to open a new business this month May 2003 you would choose either 3-12-18 or 23rd of May. Or if you were travelling, you would pick either 9-17-21 or 27th of May. The Almanac is taken very seriously and used daily by all the staff of the Feng Shui Store. Let”s take it one step further. It can work to a person”s advantage if the hour is also in harmony with the person”s year earthly branch. I must stress that this is only a general way of making the best of the situation with the limited information that is provided here. A more complete and precise analysis of a person”s best timing requires a much more in-depth interpretation of the individual”s “Bà Zi” (Four Pillars). CALCULATE YOUR CHINESE ANIMAL BELOW.